The Belgian formation FIREFORCE, playing Heavy/Power Metal since 2008, have returned to the battlefield. After their debut album, “March On”, in 2011, and many gigs later, including the one at Wizzfest (see here) in March this year, album no. 2 will be unleashed on the 20th of June 2014 via Limb Music Products. As for “March On”, the band again collaborated with Dimitri Liapakis (MYSTIC PROPHECY) to have a powerful and fitting sounds for their new tunes. “March On” was a very good album, even if the recipe has been tried and tested several times, FIREFORCE did a proper job on it. And so they do live. Considering the “never change a winning team” (except for the line-up) credo, it’s no surprise that “Deathbringer” continues where “March On” left off. Thirteen tracks, including a TYGERS OF PAN TANG cover (“Gangland” from the “Spellbound” album from 1981), to shake the ground from start to finish, taking no prisoners. It all begins with the title track, “Deathbringer”, for which a video was shot: see here. The song takes a promising start, relying on the classic riffing, building tension and then taking off into pounding Power Metal mode, of course with a touch of melody. Flype’s vocals have a rough edge and they go well with this kind of music. Firm verses and pounding drums leading into a headbang-friendly bridge that connects with the fast and catchy chorus. It’s a song by the book, but a bit more melody (via guitar or keyboards) to support the singing would not have hurt. On the contrary. The solo must be flashy, for the obvious reasons. Afterwards there’s some rebuilding… to result into another fast, flashy tour around the track. FIREFORCE is indeed on fire. “Highland Charge” builds with rough guitars, arriving into midtempo Heavy Metal land. Hymnic verses, as expected with such a song title, yet firm and powerful. Again, feel free to bang that head. It’s nice to hear, after the pounding chorus, how melodic leads, however short, link back to the verses. The midtempo solo moment cuts the song in two, after which everything returns to normal. All in all, another great job done. This could have been a GRAVE DIGGER song. You want übercatchy, melodic Power Metal? Check out “Combat Metal”. As cheesy as the title may be, the music is very tasty (even though I’m no cheese fan, but sometimes I can’t avoid the product, like on pizza, croques, …)! Straight-forward verses linking with a pounding, sing-along (“Combat Metal!”, “Combat Metal!”) chorus. During the solo moment, it’s hard to sit still, with those pounding drums and shredding guitars. After another round of the usual, a musical moment takes over to prepare the way for a fast outbreak and another flashy solo. Great stuff, indeed! Hymnic, midtempo Power Metal can be found in “To The Battle”, where the music flows more smoothly in the bridge and chorus. Do sing along with the chorus: “To the battle… (…) To the battle…”. What is also nice here, is the mysterious, semi-acoustic break with Metal bursts, before the obligatory solo is due. Once that happens, it’s with the support of full-on musical power. Afterwards, all reverts to normal. I found “Attracted To Sin And Lust” not as strong or attractive as most other songs on this new album. It begins melodically, there’s some tension at first, and then it takes of in vein of MANOWAR’s “Blood Of My Enemies” (from the “Hail To England” release, 1984), only FIREFORCE play a little faster. Flype’s vocals sound lower, viler, more raw, inline with the darker character of the song. The chorus, on the other hand, has a somewhat theatrical feel. With regards to variety, the band is doing a good job so far. Buckle up then for “Words Of Hatred”, a fast track, hymnic in the chorus. I’d compare it with PRIMAL FEAR and BRAINSTORM. Of course, the solo follows suit and is pretty wild. Keeping the tempo high, here’s – no, not Johnny – “King Of Lies” with its fast, pounding, melodic music. Again a distinction was set up between the firm, straight-froward verses (check that leadwork) and the fast, pounding chorus. The intro theme returns in preparation of the solo and to end that part of the song, so the band can carry on with the rest. So far, still very tasteful Metal. “Aeons” rolls onwards at midtempo. Leads are set early in the song. Contrast is created between the calm verses (featuring only vocals, bass and drums). In a next instant, a touch of Heavy Metal kicks in, like how the song started. The music in the (hymnic) chorus is fairly predictable, though. Far from bad, just predictable. There are two guitarists in the band. Why, then, is there only one (Yves?) playing during the solo? I do like the idea, as it breaks with conventional expectations, and puts the solo more in the spotlight. The other one then joins in again when it’s time for a fuller solo moment. “Anubis – Lord Of The Dead” begins like an engine pulling up, while drums already go ahead. This midtempo, guitar-oriented rocker should have had more melodic input to create that specific atmosphere and setting. Keyboards (or samples) would have been advisable. See, for example, BRAINSTORM’s “Trinity Of Lust” on their “Soul Temptation” album (2003). Sure, the song sounds hymnic, but it lacks a little in the melodic instrumentation department. Especially the dancy chorus suffers a bit from it. Another song that could have used such melodic, atmospheric input is “Sekhmet – Warrior Goddess”. This one begins with the guitar, while the drums help it slowly advance. A little shift indicates another high tempo outbreak is near, but the speed is not there. However, it is still a tight, power and catchy song. No question about that! Straight-forward verses link up with a pounding bridge and ditto chorus, where there are… keyboards? Samples? In any case, here the band did think of adding atmospheric sounds to go with the song title. Also, before the solo there are some Easter influences. This is another dark song, but more upbeat than “Attracted…”. “MN29” is a slow, hymnic Heavy Metal song. Quite linear, in vein of e.g. PRIMAL FEAR, to some extent. The band comes clean halfway: clean music, clean singing (no rough edges). Metal is added to rise to the climax that is the solo. And here the band shifts into 6th gear, for you get fast Power Metal with the solo. Talk about an unexpected turn of events. Afterwards it back to business of before. Last but certainly not least, the TYGERS OF PAN TANG cover: “Gangland”. The original is a very good classic, FIREFORCE’s rendition is heavier, of course, but also worth hearing. A job well done. After the solid “March On”, FIREFORCE have indeed worked hard on this follow-up, “Deathbringer”. Melodic Power Metal, old school style, that can stand the test of time for years to come. I even dare say that the new tunes will convert more souls, or rather, keep the converted firm in line. 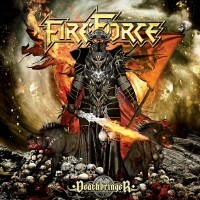 FIREFORCE are indeed flag bearers of Power Metal in Belgium. Despite a few details, it is safe to say that “Deathbringer” is very much recommended.